“The DSEI arms fair is the biggest arms fair in the world and takes place at Excel, East London, every two years. Corrupt regimes from all over the world are invited, and here they do deals to buy weapons to oppress their own people. The purpose of the day of action had been to stop the arms fair from setting up, and stop it from happening at all. We didn’t just want to have a protest outside. We are sick of this death spectacle in East London. We are sick of the government subsidising and protecting this industry which kills and maims people. We are sick of being told the lie that there is no money for the NHS and education and other essential public services, when they can find money for war. We are opposed to militarisation and opposed to the business of war – in which the UK government and arms companies are key players. At the time of the day of action, the UK government was pushing hard for military intervention in Syria (as if the UK government had a good track record of military intervention in other countries) and which would have inevitably worsened the suffering of the Syrians. We are also particularly disgusted with the UK government’s hypocrisy –with its rhetoric on human rights and democracy, whilst consistently ignoring our own domestic laws on arms control. In fact, the complicity of the authorities and regulators goes beyond merely ignoring the law they are responsible for enforcing, but also helping to hush it up when crimes are exposed to the public. Since our arrest, we have taken steps to try and uncover the true extent of profoundly criminal activities at DSEI. We have sent Freedom of Information requests to the Metropolitan Police and to HMRC. We asked whether any criminal investigations had taken place against the arms companies kicked out of the arms fair for breaching UK law (in the words of Clarion, the arms fair organiser). We asked how many investigations have taken place in relation to previous DSEI arms fairs, and about enforcement action generally. The response to all our questions from both the Police and HMRC was ‘neither confirm nor deny’, even though some of the information we asked them to confirm was already in the public domain. ‘Confirm nothing’ seems to be the approach they are determined to maintain. The questions are legitimate and of the highest public interest. We have appealed the decisions and the authorities again refused to disclose, citing more or less every exemption available under the Freedom of Information Act. We are continuing to press for that information (see our Freedom of Information requests here and here). We understand that there has been no action against the arms companies who committed crimes at DSEI 2013, and that there never are any prosecutions when crimes take place at DSEI arms fairs. Our lawyers, Hodge, Jones and Allen also tried to get disclosure of enforcement action through the courts, since some of us were putting forward a justification defence. We intervened to stop the set up of the arms fair to prevent crimes of torture and crimes against humanity and war crimes from taking place. It seems the case against us was dropped as the authorities do not want to have to deal with our questions. As part of our defence we contacted arms experts to comment on the torture equipment on offer at DSEI 2013, and the history of criminal activities at DSEI generally. We had an expert opinion from Amnesty International, which states that “to my knowledge there have been specific breaches of UK arms export control legislation at every DSEI fair since 2005” and “Repeat failings to prevent the promotion of illegal items at DSEI defence exhibitions clearly demonstrates serious failings in the capacity of the UK government to enforce its own laws in this area”. 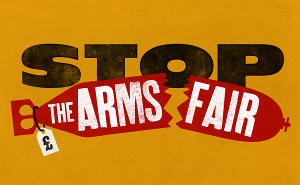 A fundraiser for Stop the Arms Fair takes place this Saturday 22 February 2014, in Stoke Newington, London. We hope to see you there!